Before being able to deploy CryptoPhoto cPanel plugin, you must register a new CryptoPhoto administration account and obtain API Keys, which will be used to configure the cPanel plugin. Note: Prior to installing cryptophoto-1.0-1013.cpanel.noarch.rpm, if you already have cryptophoto-1.0-1012.cpanel.noarch.rpm or older installed, uninstall it as describe here. Once the package is installed you can start configuring the plugin. First we need to set the API Keys that will be used with the CryptoPhoto deployment. Go to "Main >> Plugins >> CryptoPhoto >> Settings" and type in the API Keys obtained when you've configured your website with the CryptoPhoto administration account. Note: The "Salt" is used to create unique user IDs. It is recommended to use a random string and once set, not to change it, otherwise the CryptoPhoto settings for each of your users will be reset. Additionally, the administrator can enable/disable CryptoPhoto Authentication on per-user basis (the user can still enable it at a later time if he or she wishes it). 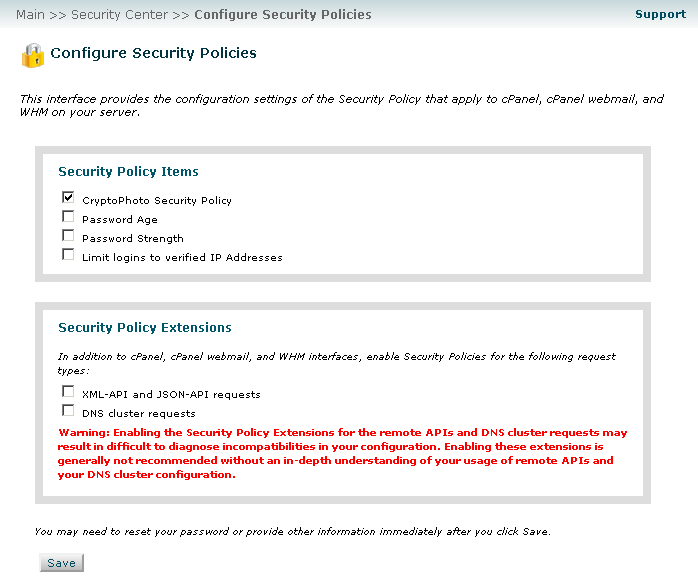 Once you've configured the plugin, you can activate it by going to cPanel Security Policies ("Main >> Security Center >> Configure Security Policies"), check "CryptoPhoto Security Policy", and then click "Save". From this point on, your users can download/enroll new tokens and opt-in CryptoPhoto Authentication. The User CryptoPhoto Settings will be available for your cPanel users, under Security Panel.